A big welcome to Diane who joined our team this week! 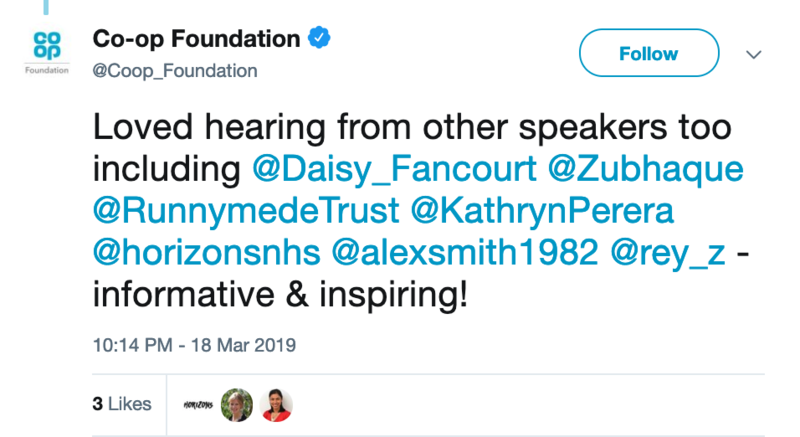 Kathryn gave a talk at the British Academy event on Loneliness. We're delighted that Horizons Fellow @JodemeGoldhar from Canada is shadowing us for a couple of weeks. She is writing a series of blog #jodemeontour to record her experience. 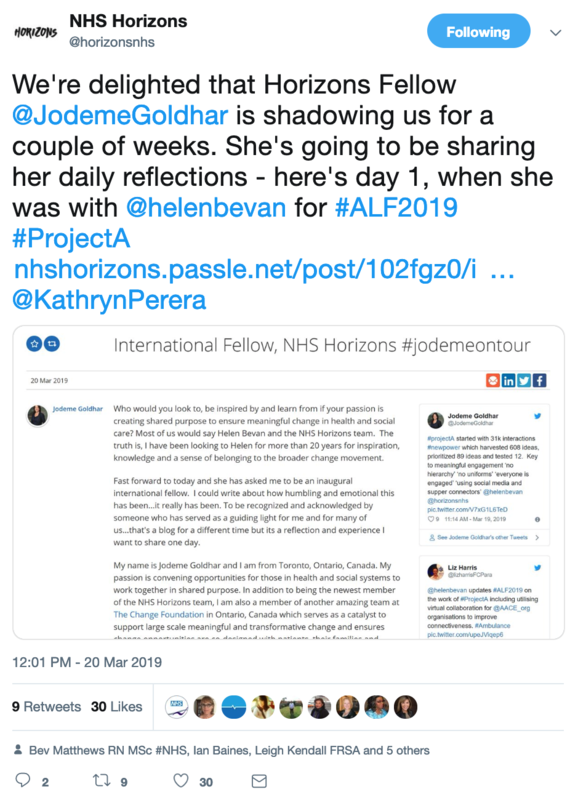 On Day 1, she shadowed Helen. 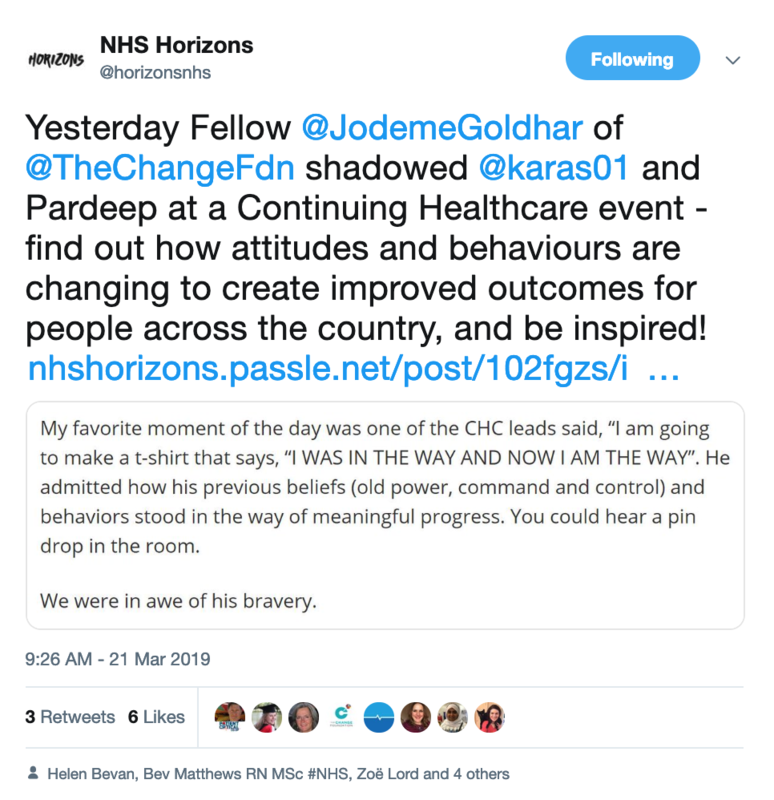 Day 2 of #Jodemeontour: she shadowed Sasha and Pardeep at a Continuing Healthcare event. 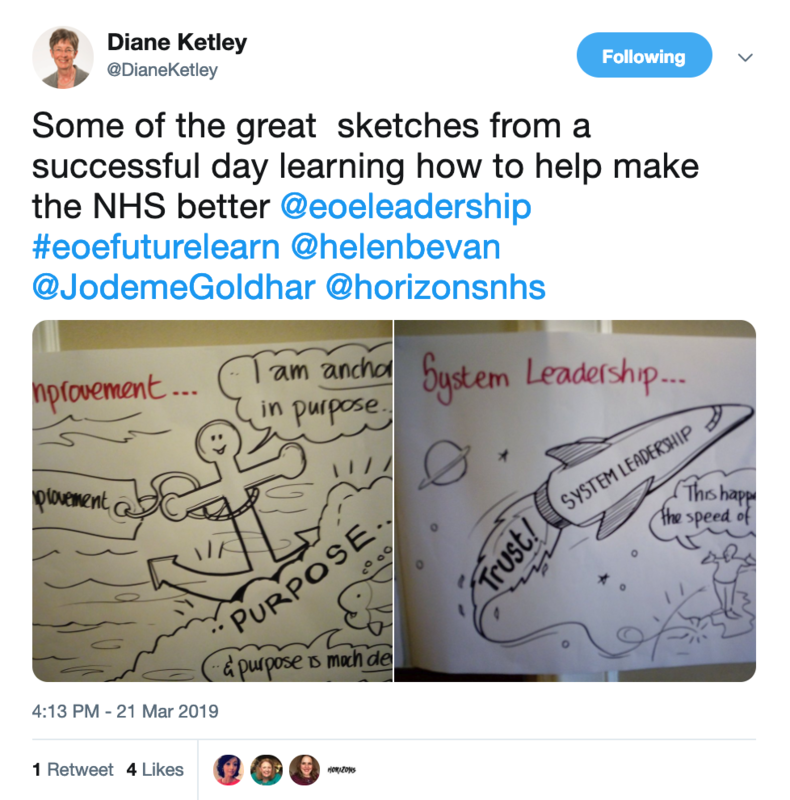 Diane, Helen and Jodeme facilitated an event for the NHS Leadership Academy of the East of England. They spent the day working on making change happen, building relationships and trust. They had a shared purpose is at the heart and focus of their transformation. Want to know what they did? 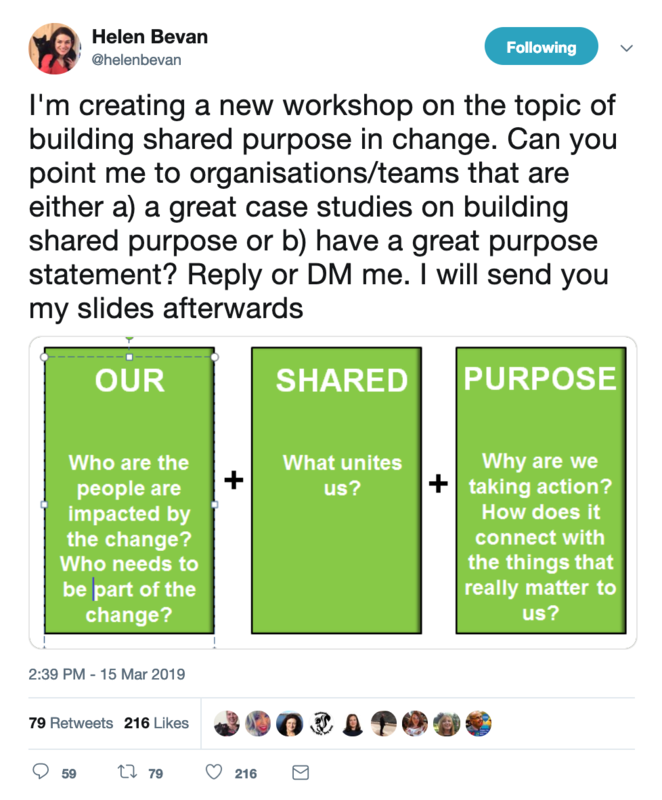 Read #Jodemeontour Day 3: our shared purpose to find out! 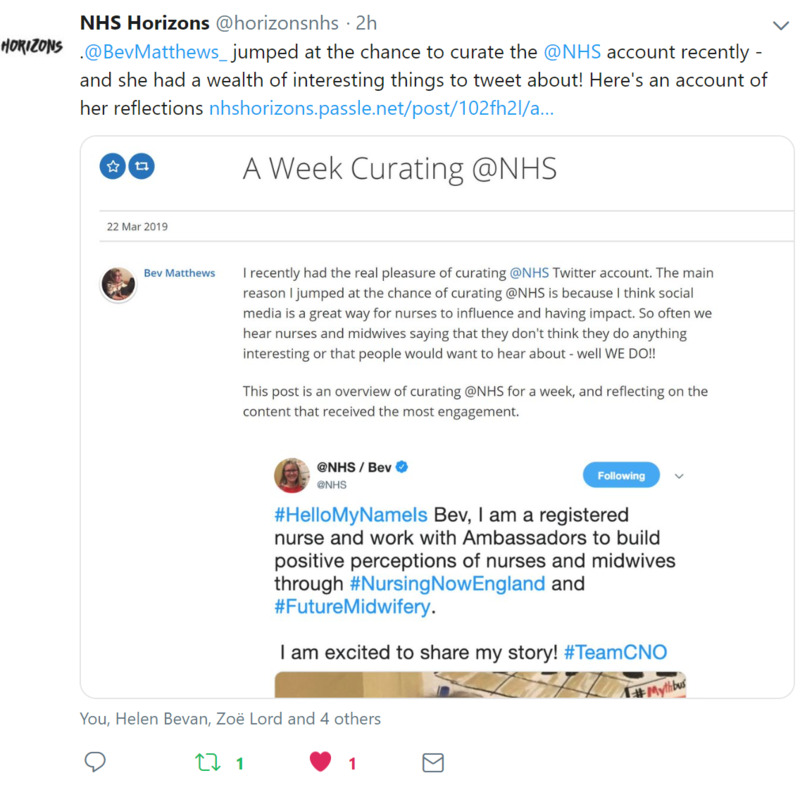 Bev curated the @NHS account recently - read about her reflections. 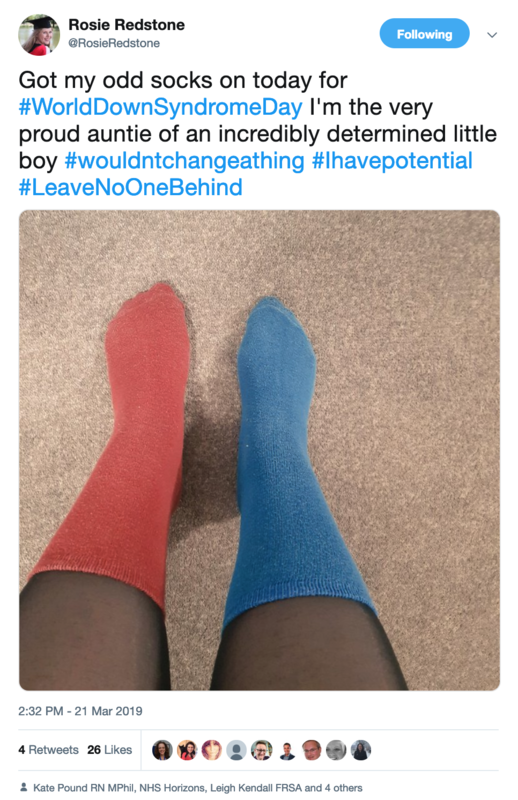 Rosie wore odd socks to raise awareness of Down Syndrome. We're grateful to all the people helping spread the word about School - you can sign up here. 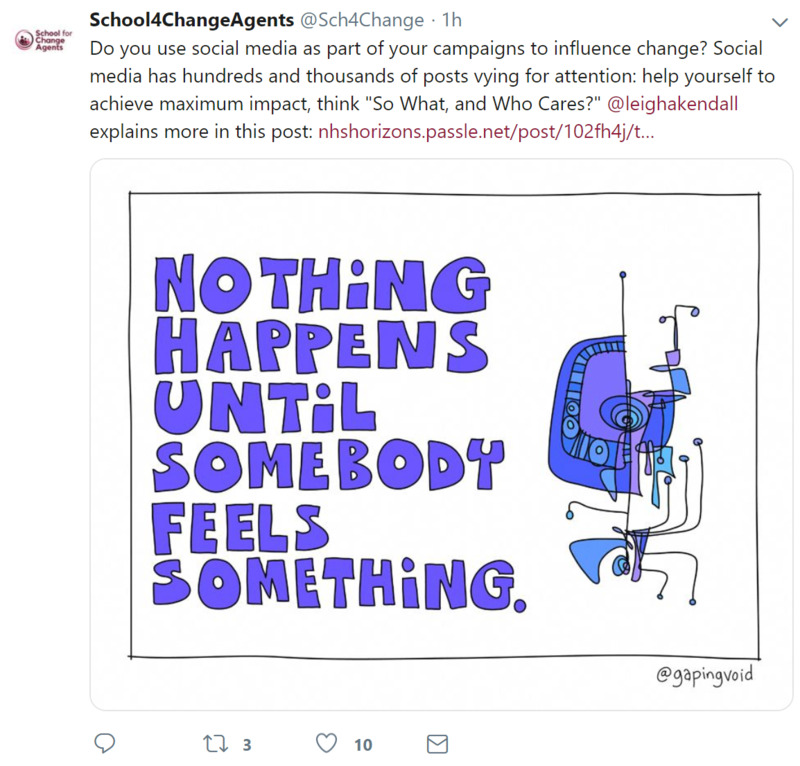 Do you use social media as part of your campaigns to influence change? Social media has hundreds and thousands of posts vying for attention: help yourself to achieve maximum impact, think "So What and Who Cares?" Leigh explains more in this post. 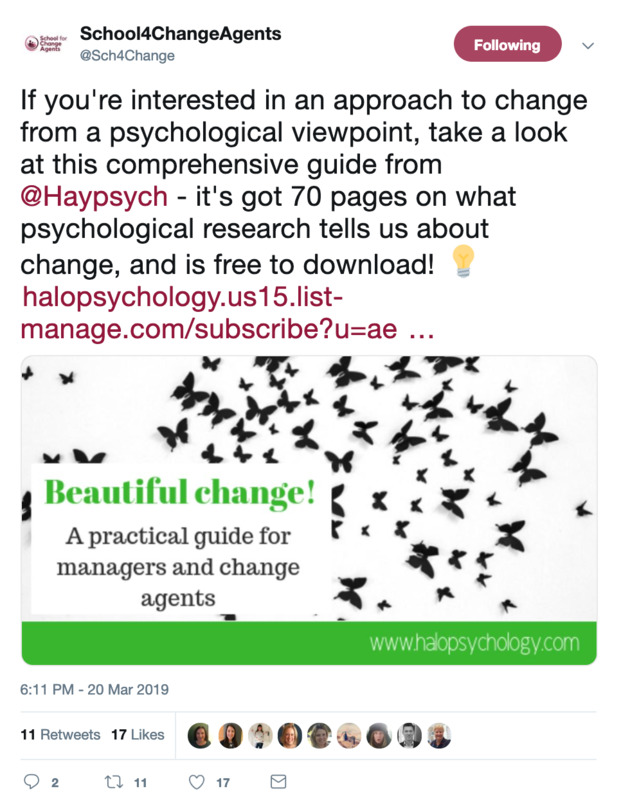 If you're interested in an approach to change from a psychological viewpoint, take a look at this comprehensive guide from @Haypsych - it's got 70 pages on what psychological research tells us about change, and is free to download! 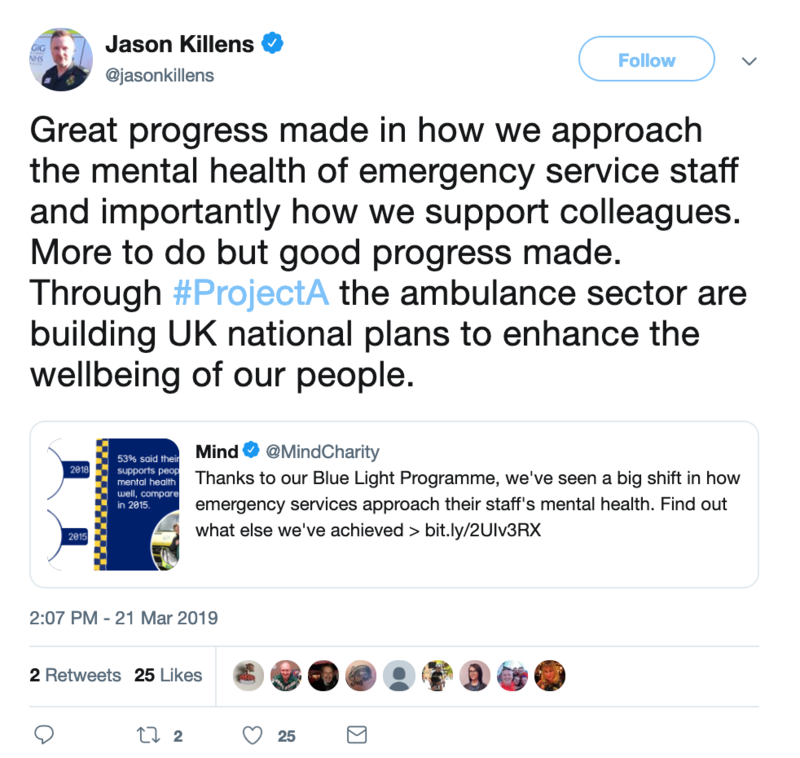 Through #ProjectA the ambulance sector is building UK national plans to enhance the wellbeing of ambulance staff. 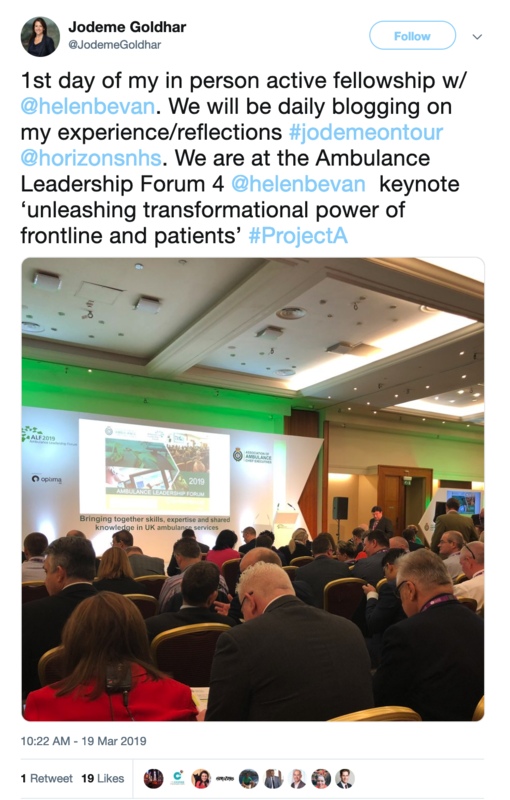 Helen shared the latest progress of #ProjectA at the Ambulance Leadership Forum 2019. 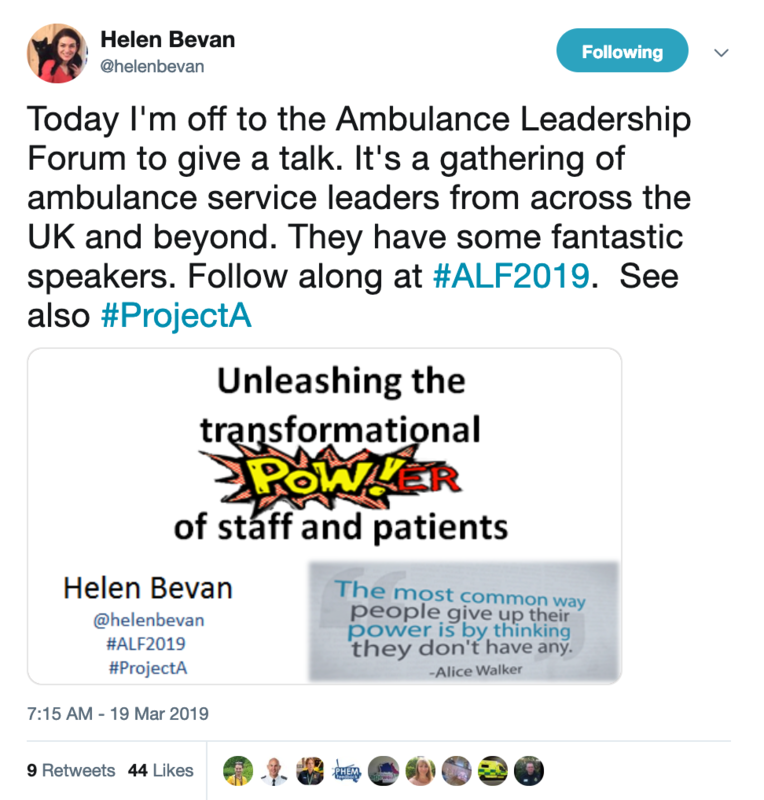 Here's Helen's slides. 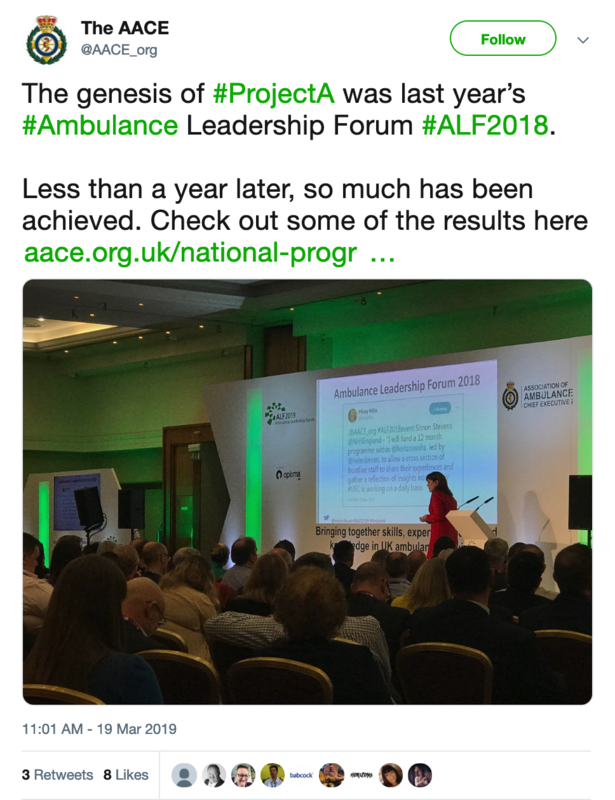 #ProjectA has achieved some excellent results in the ability to influence. 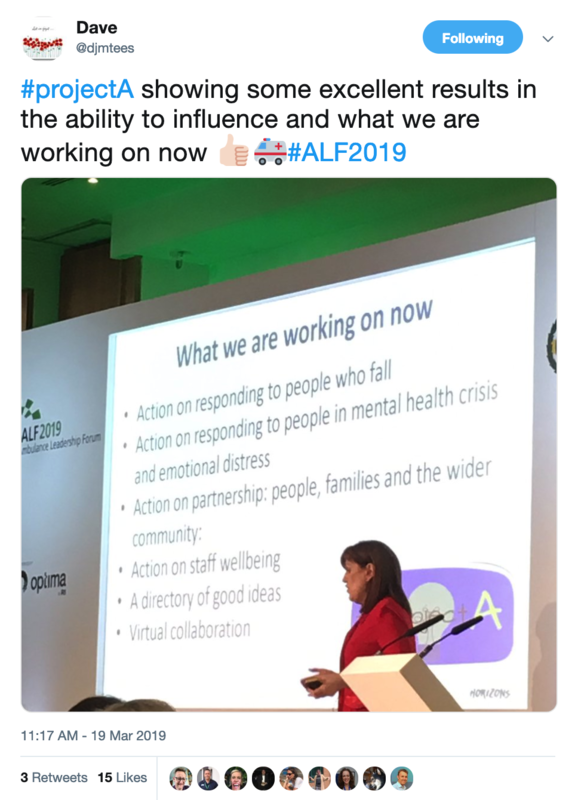 Helen also updated everyone about what we are working on now. 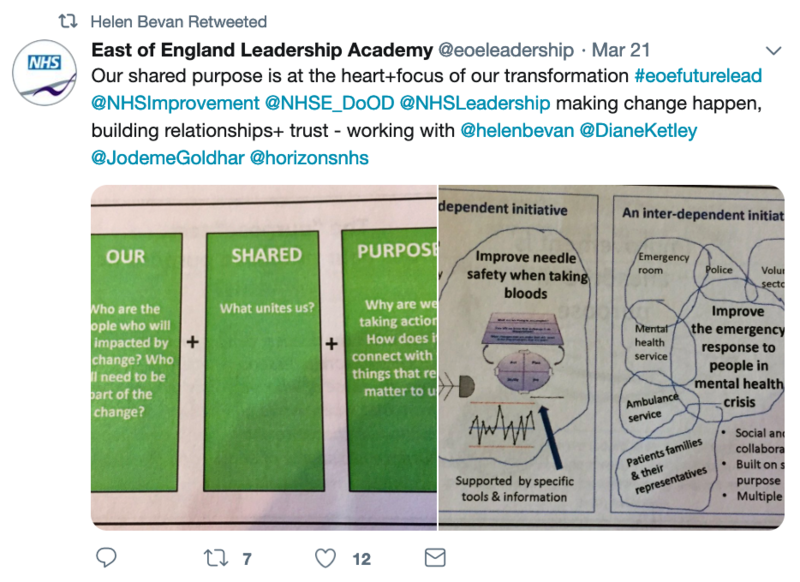 The Directory of Good Ideas’ origin and purpose…a quick recap. 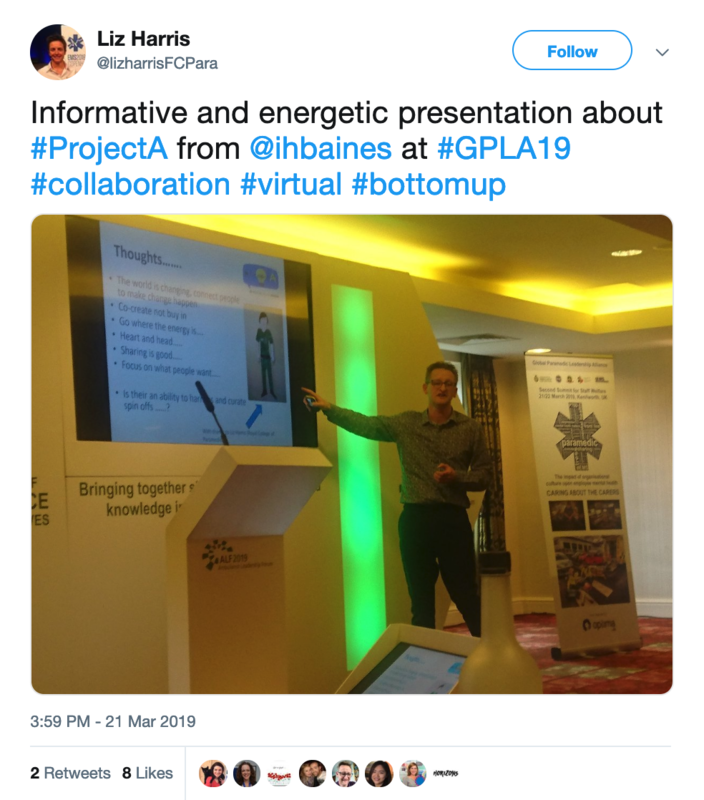 Ian shared the journey of #projectA at the 2019 Global Paramedic Leadership Alliance with colleagues from Canada, the USA, New Zealand, Australia and the UK. 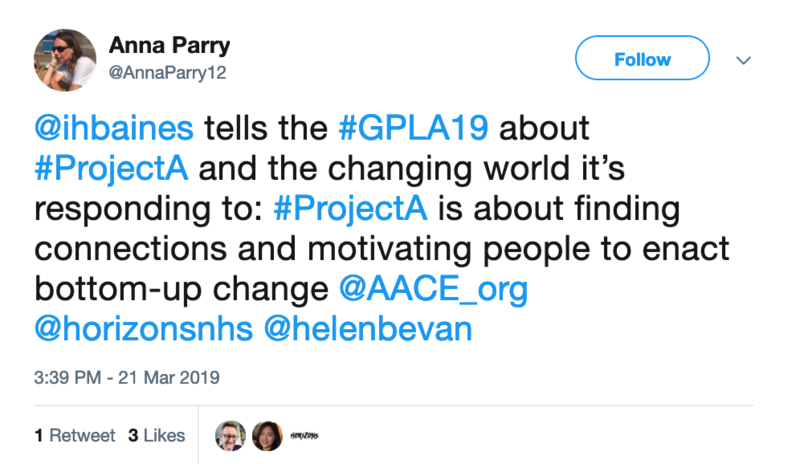 #ProjectA is about finding connections and motivating people to enact bottom-up change. 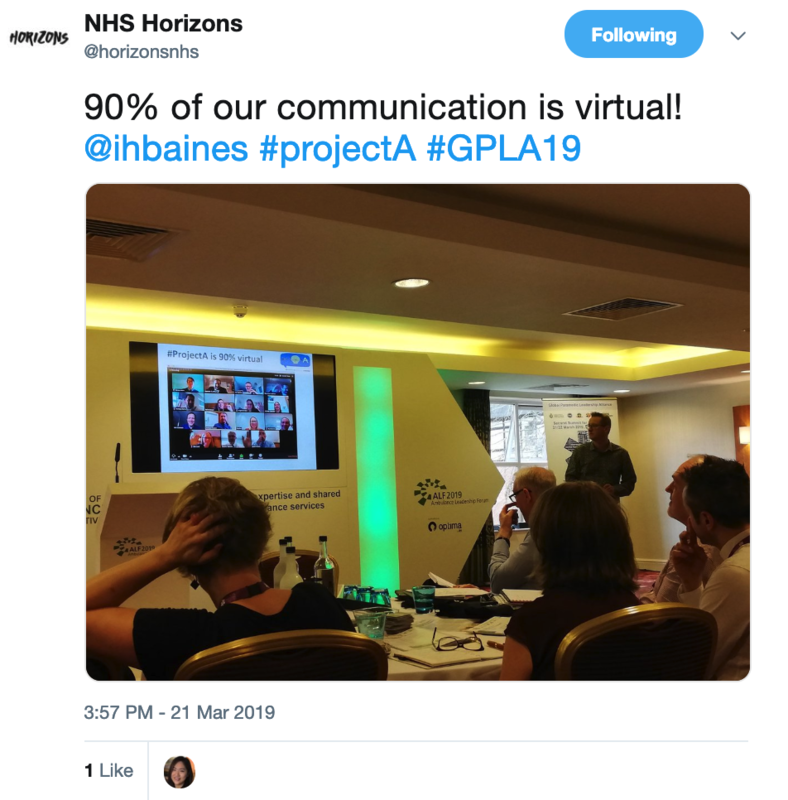 Do you know that 90% of the communication of #ProjectA is done virtually? 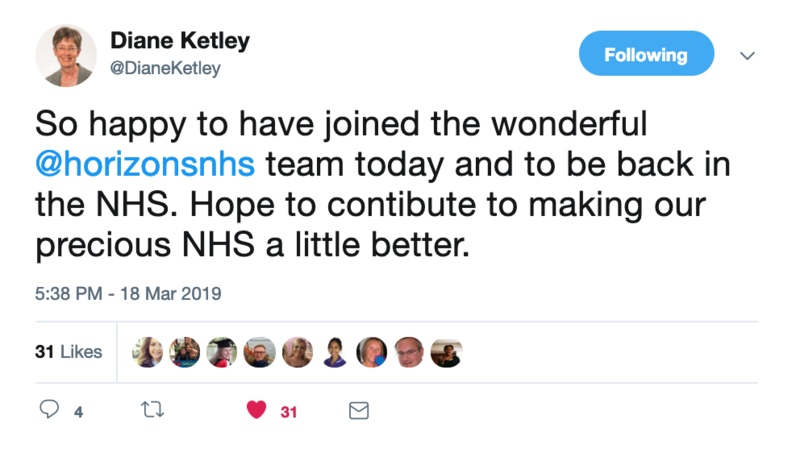 A national improvement programme involved thousands of front line staff! 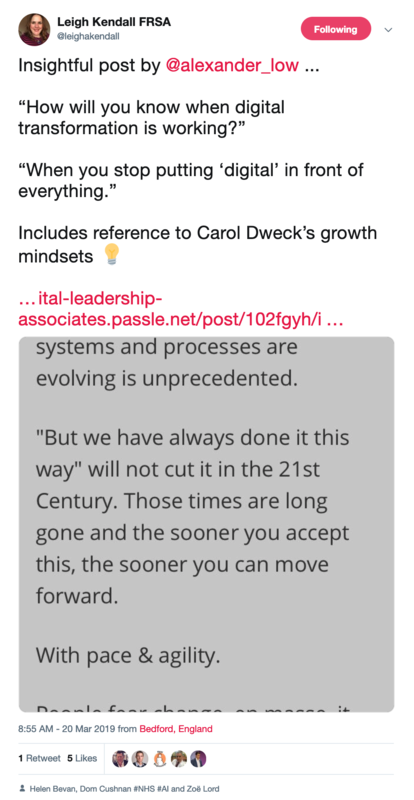 #Project A is all about connecting the system to itself, not duplication. Our March 30 Day Challenge is Randomised Coffee Trials. 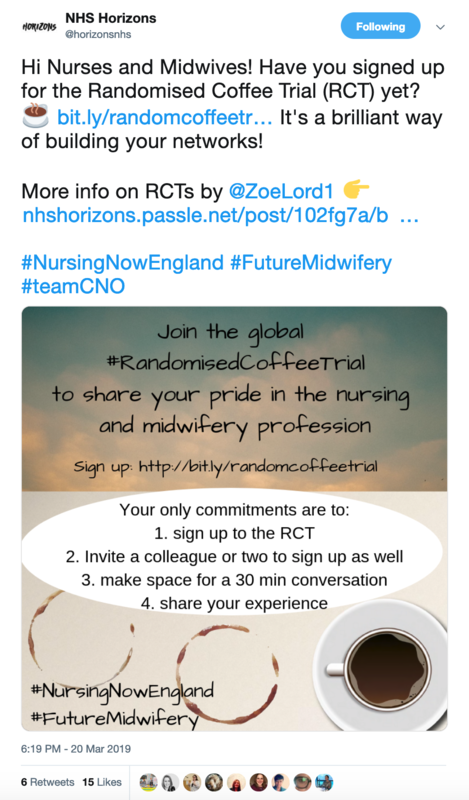 Want to know more about RCTs? Read Zoe's blog. If you'd like to sign up, click here. 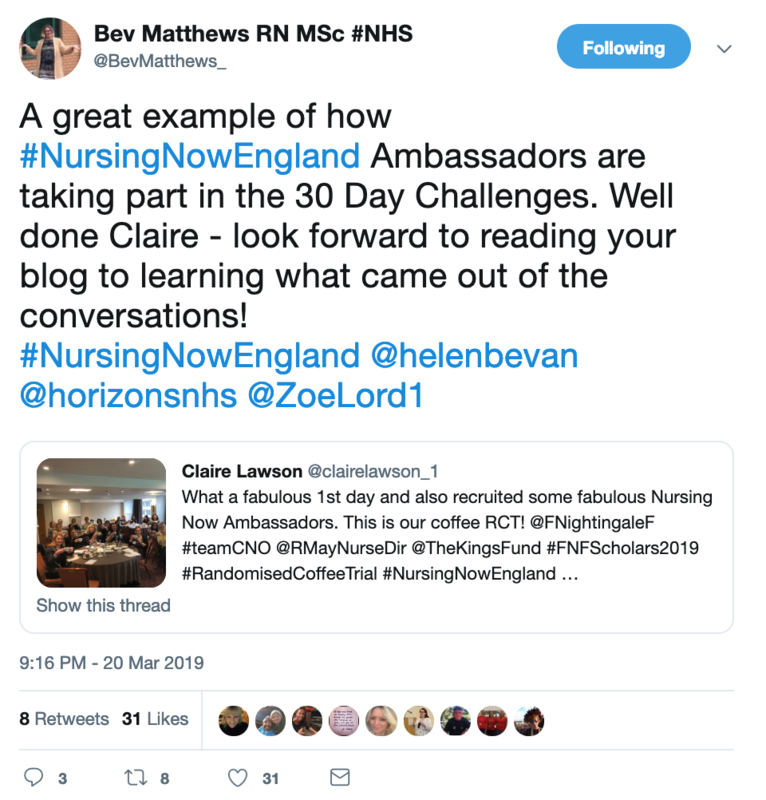 A great example of how #NursingNowEngland Ambassadors are taking part in the 30 Day Challenges - Ambassadors took part in a RCT at the Florence Nightingale Foundation course for emerging leaders. 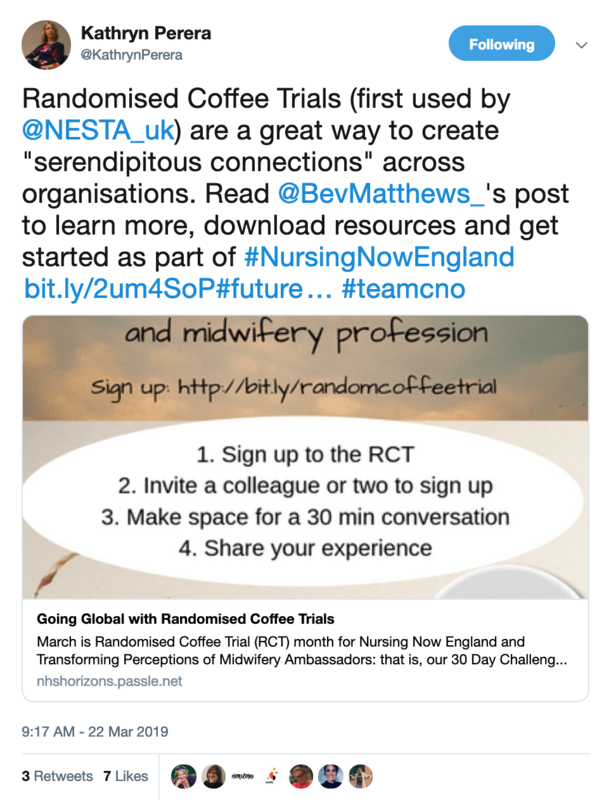 Read Bev's blog on Going Global with Randomised Coffee Trials. 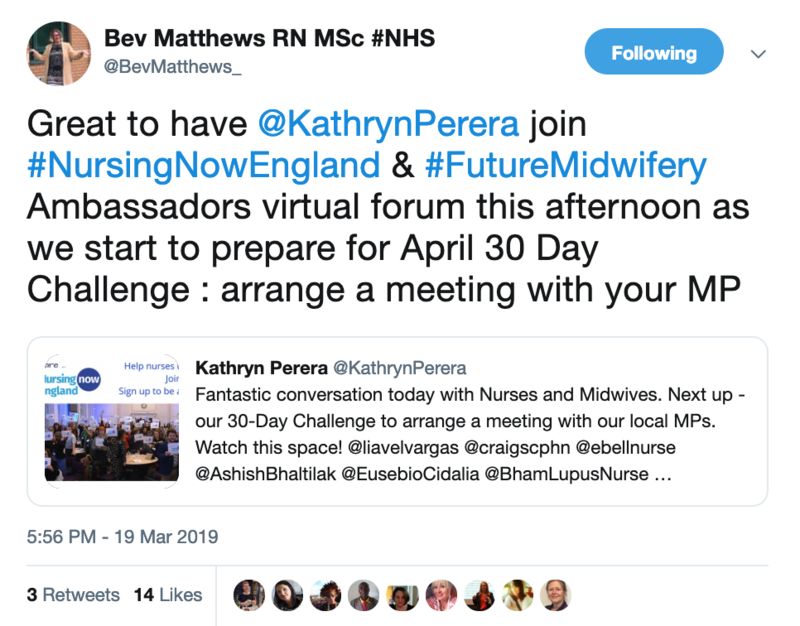 @KathrynPerera joined #NursingNowEngland & #FutureMidwifery Ambassadors virtual forum as we start to prepare for the April 30 Day Challenge: arrange a meeting with your MP. 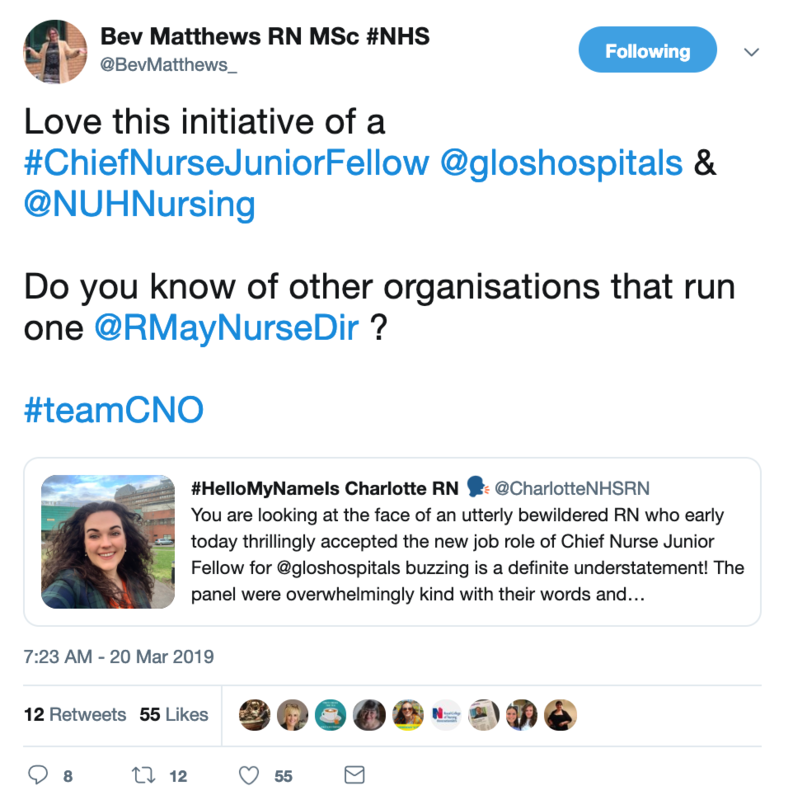 The role of #ChiefNurseJuniorFellow for junior nurses and midwives is a brilliant idea. 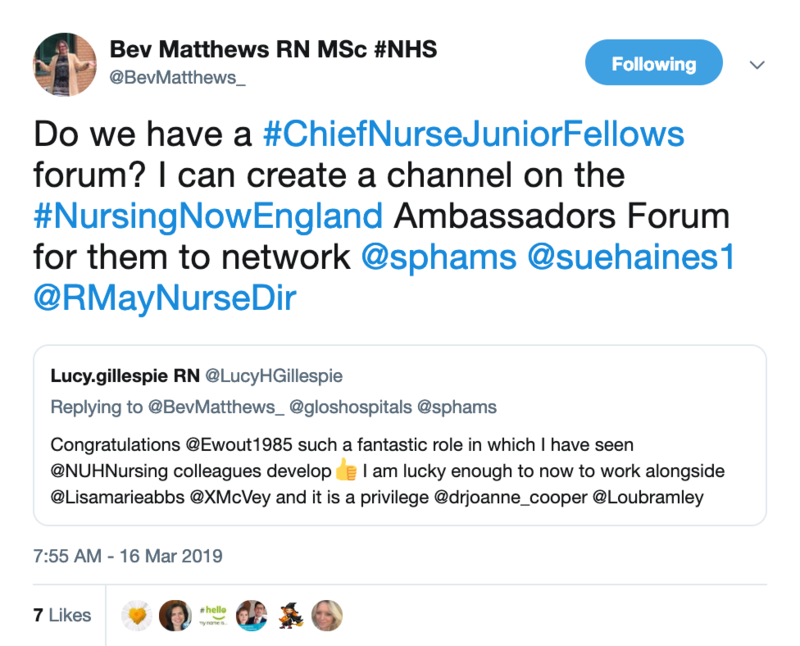 Bev asked if we have a #ChiefNurseJuniorFellows forum, she'd love to create a channel on the #NursingNowEngland Ambassadors Forum for them to network. 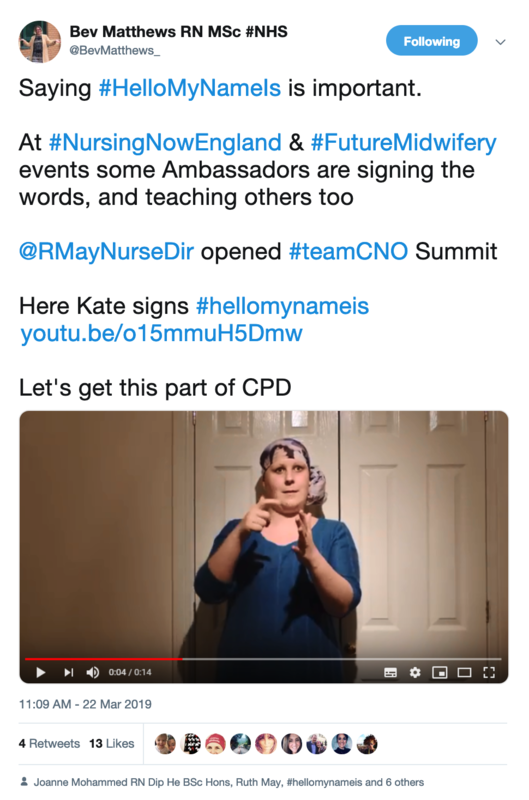 Saying #HelloMyNameIs is important. 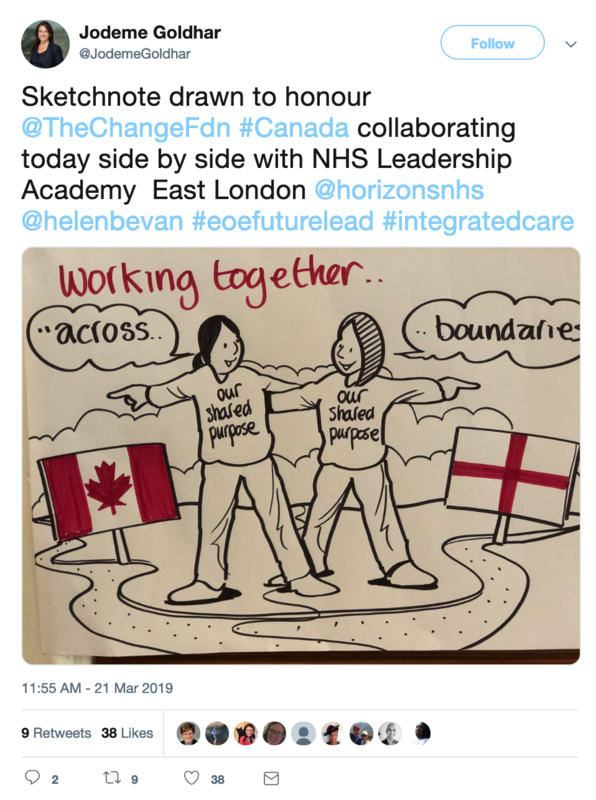 At #NursingNowEngland & #FutureMidwifery events some Ambassadors are signing the words, and teaching others too. 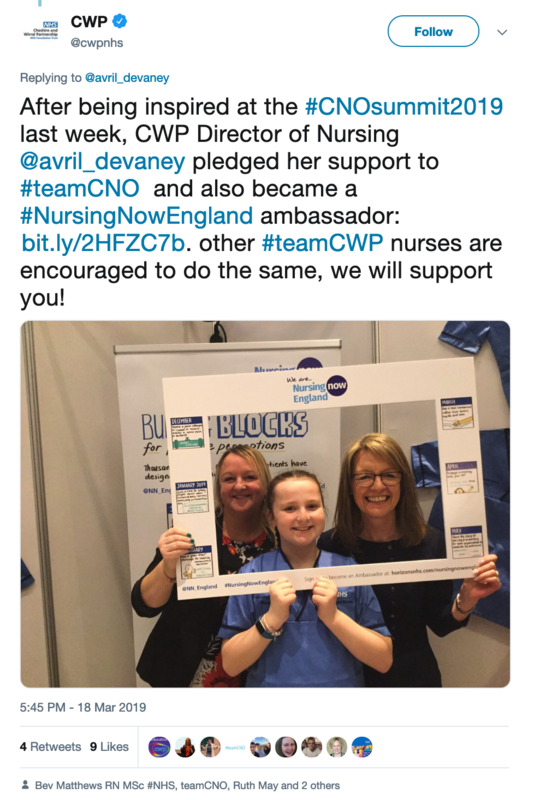 Many new ambassadors have started getting involved after signing up at the CNO summit. 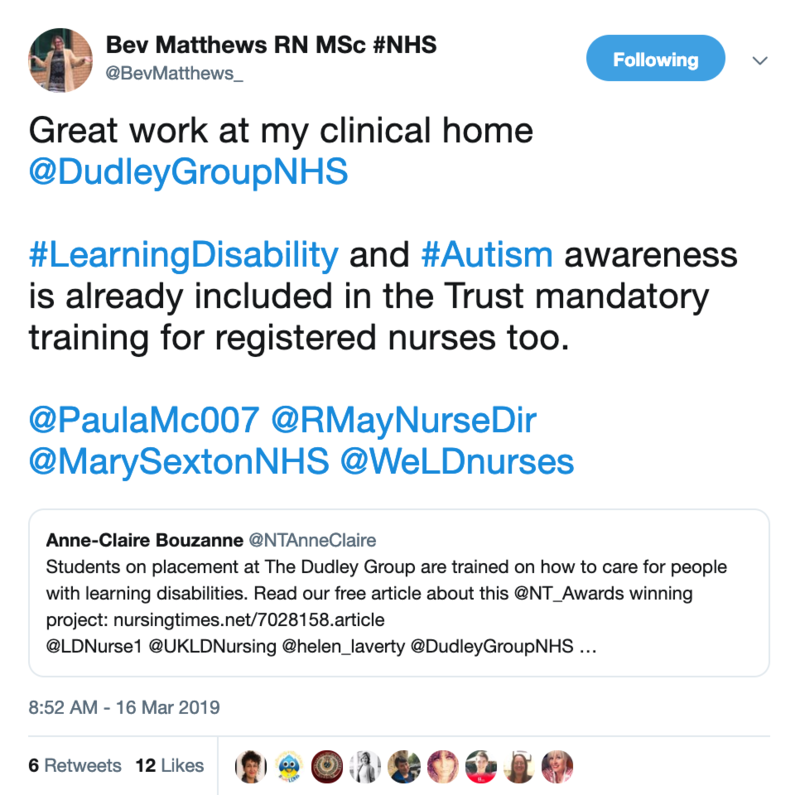 It is important to have training on autism and learning disability for all nurses. 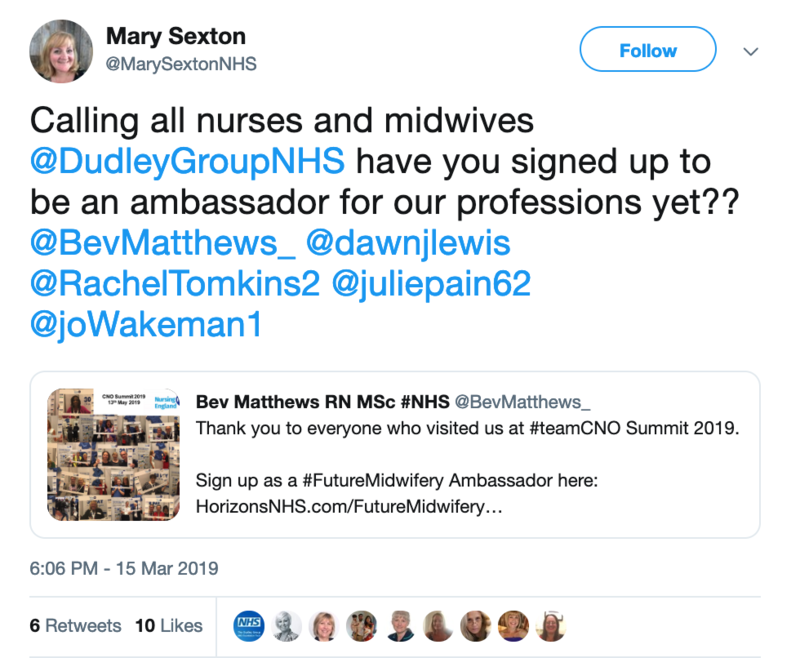 Have you signed up to become a Transforming Perceptions of Midwifery Ambassador? 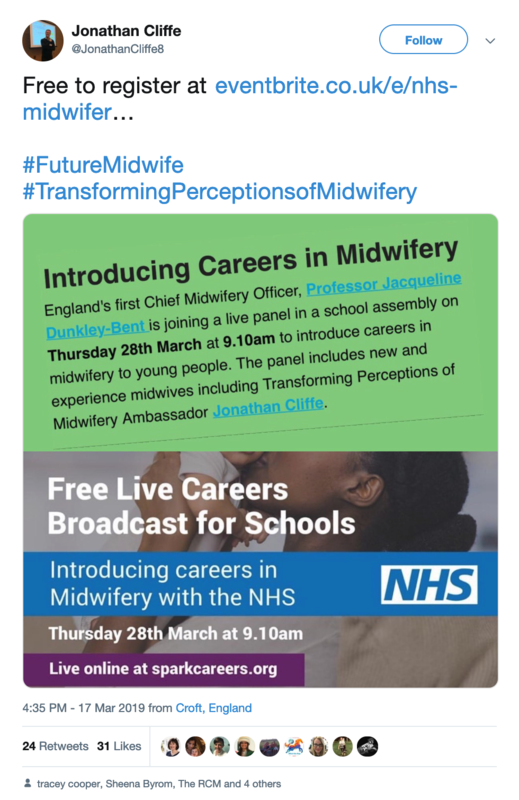 Working with #WeAreTheNHS, this session is being planned to live stream into schools with Chief Midwifery Officer Professor Jacqueline Dunkley-Bent and Future Midwifery Ambassador Jonathan Cliffe on the panel. 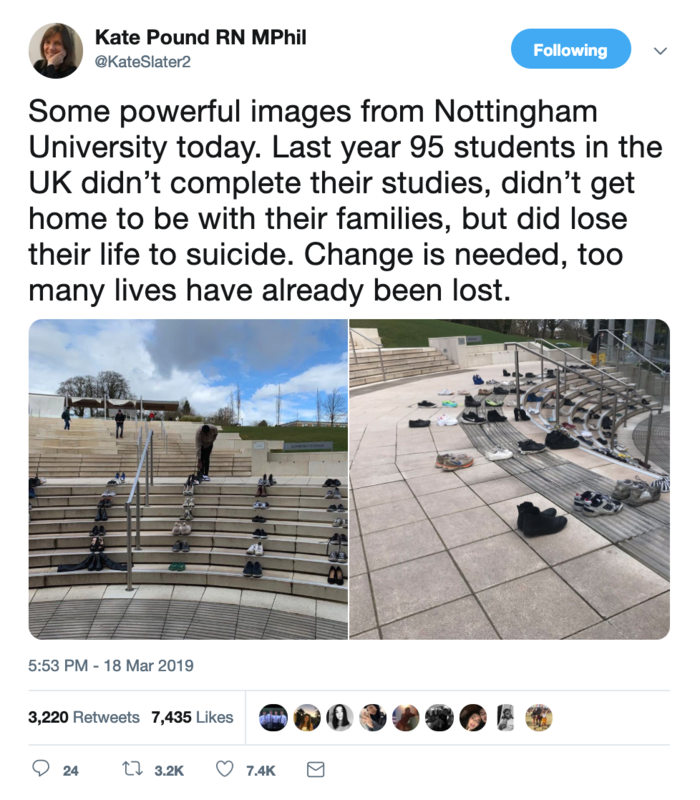 Powerful images from Nottingham University. Last year 95 students in the UK didn’t complete their studies, didn’t get home to be with their families, but did lose their life to suicide. Change is needed, too many lives have already been lost. There's been a massive response to this post, and as a result a social movement is getting started to address this issue. Find out more: #1LifeIs2Many. 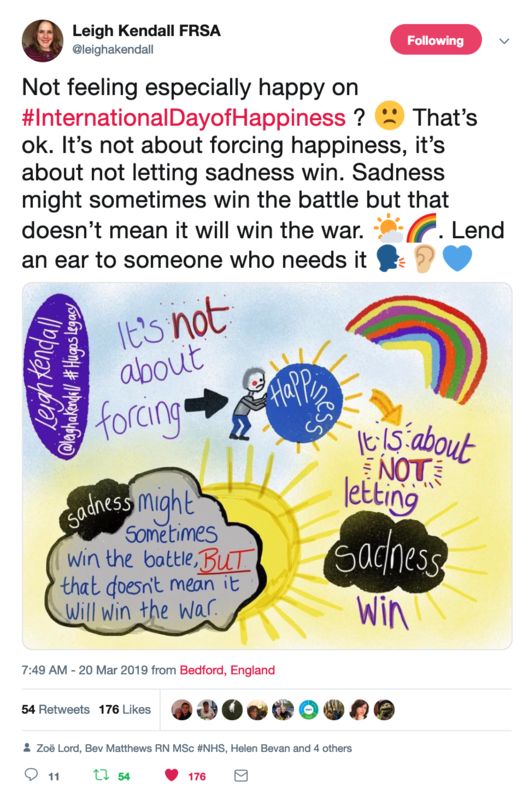 Sadness might sometimes win the battle but that doesn’t mean it will win the war. A beautiful sketch by Leigh. Mental ill health can affect anyone: we need to remove the stigma & offer more workplace support. 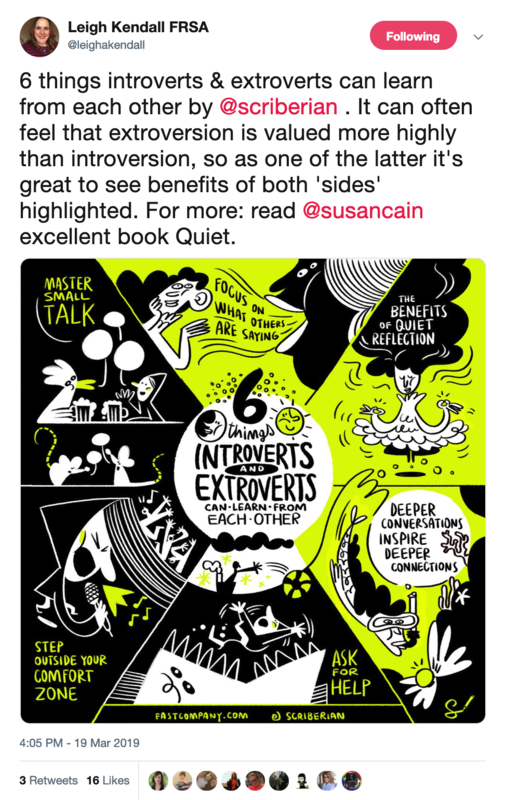 Six things introverts & extroverts can learn from each other. 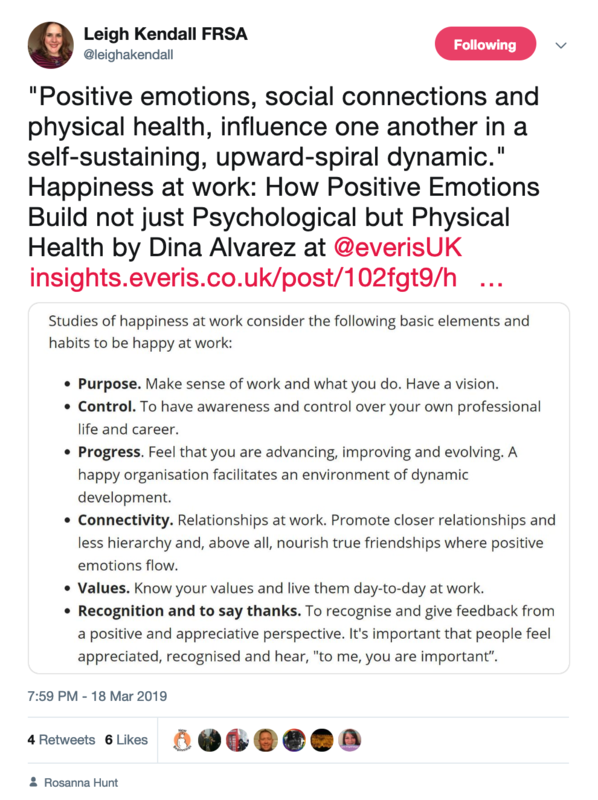 Happiness at work: How Positive Emotions Build not just Psychological but Physical Health. 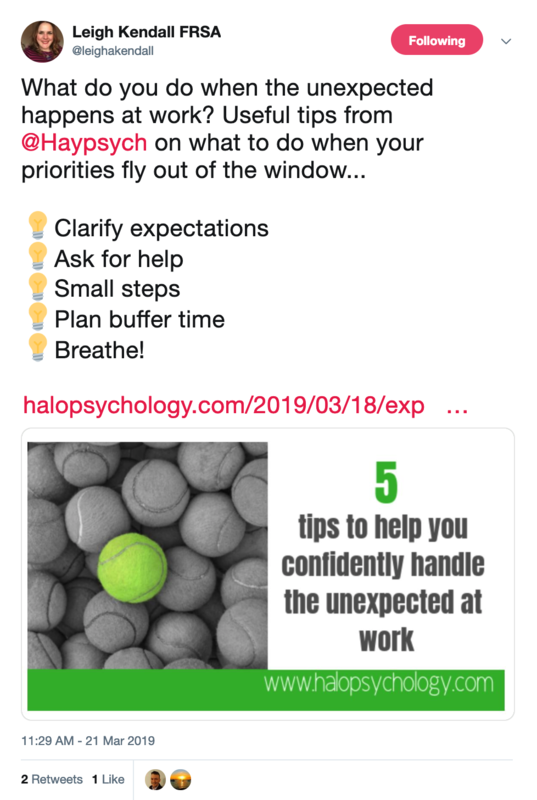 Expect the unexpected: 5 tips to help you confidently handle curve balls in the workplace. Kindness is powerful. 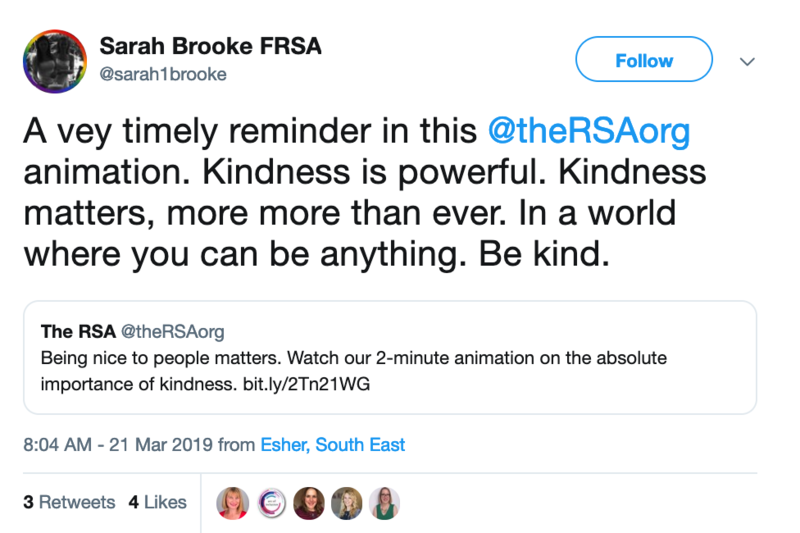 Kindness matters, more more than ever. In a world where you can be anything. Be kind. John Lloyd turns his curiosity to knowledge itself, and questions whether intelligence is really all it's cracked up to be. 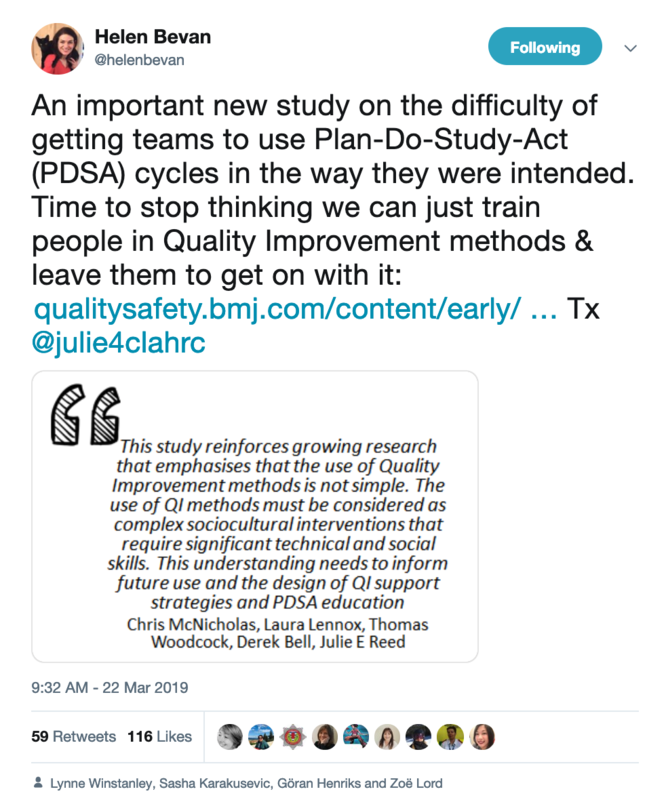 An important new study on the difficulty of getting teams to use Plan-Do-Study-Act (PDSA) cycles in the way they were intended. 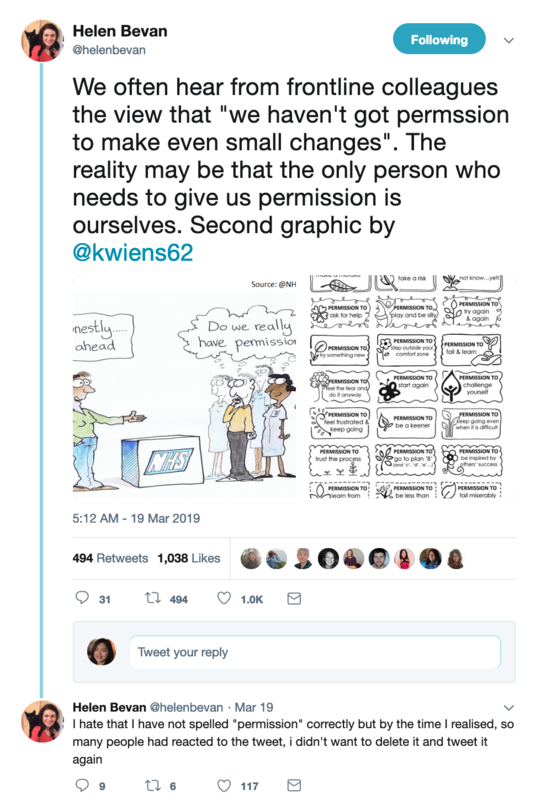 Time to stop thinking we can just train people in Quality Improvement methods and leave them to get on with it. 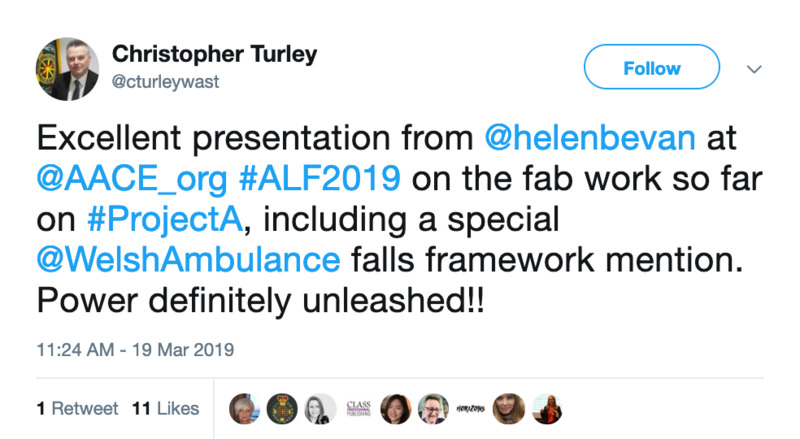 "Exploring the new world: practical insights for funding, commissioning & managing in complexity." 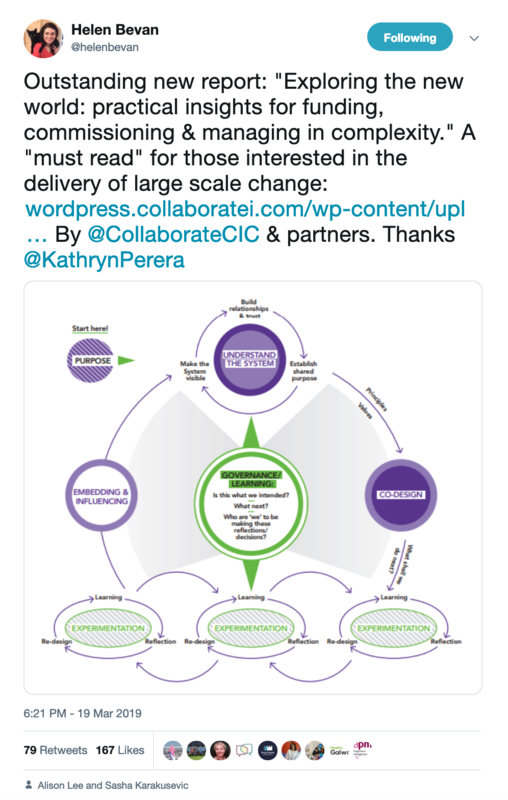 A "must read" for those interested in the delivery of large scale change. 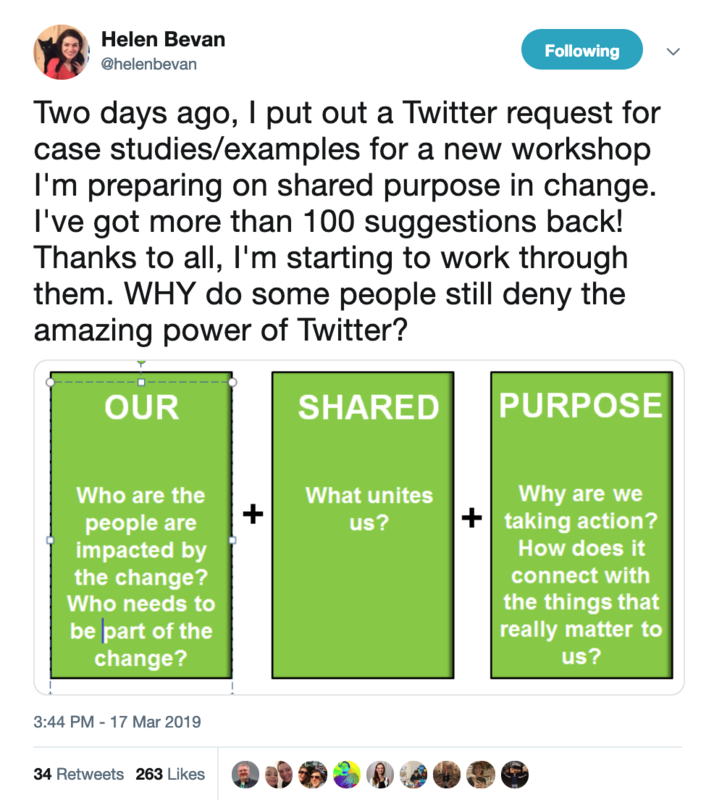 Helen decided to crowd source some ideas to create a new workshop on the topic of building shared purpose in change. Helen got more than 100 suggestions back in two days. That's the power of Twitter! The reality may be that the only person who needs to give us permission is ourselves. 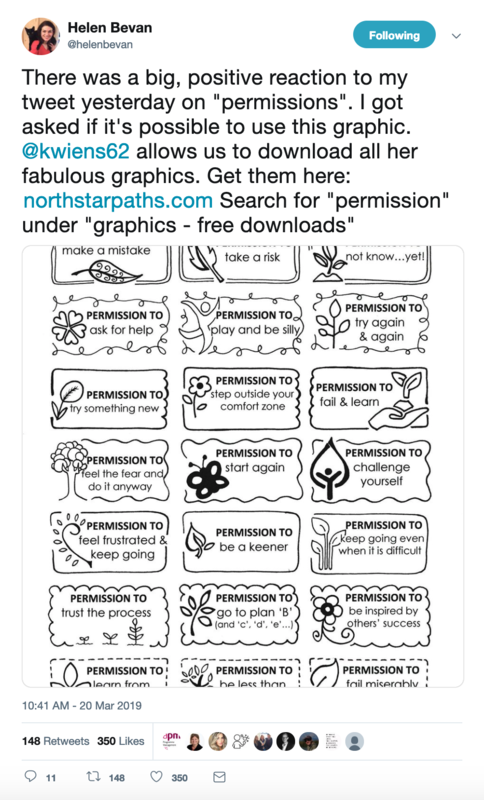 Helen tweeted about "permissions" before, and now she got the permission on our behalf to use the great graphic on permission. 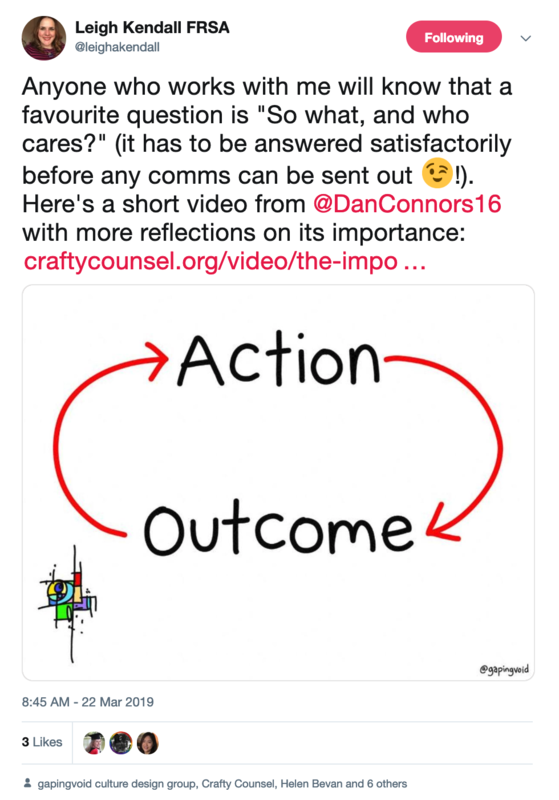 A short video from @DanConnors16 with reflections on the importance of asking: " So what?" 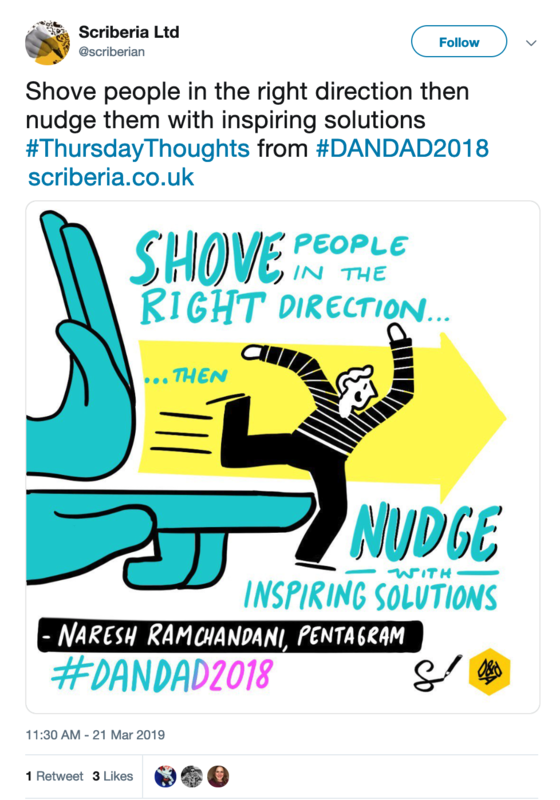 Shove people in the right direction then nudge them with inspiring solutions. 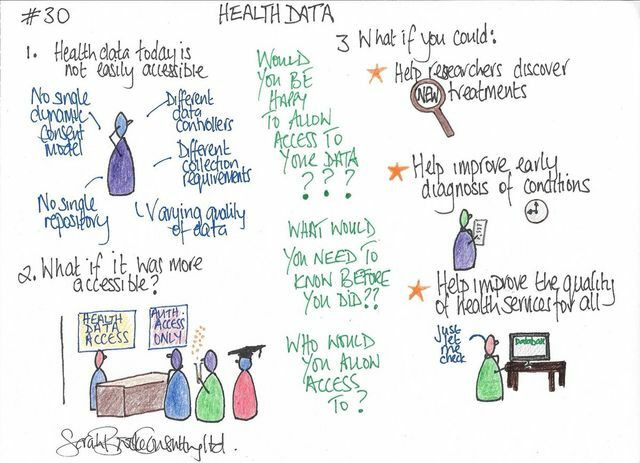 Your own personal health data is not easily accessible. 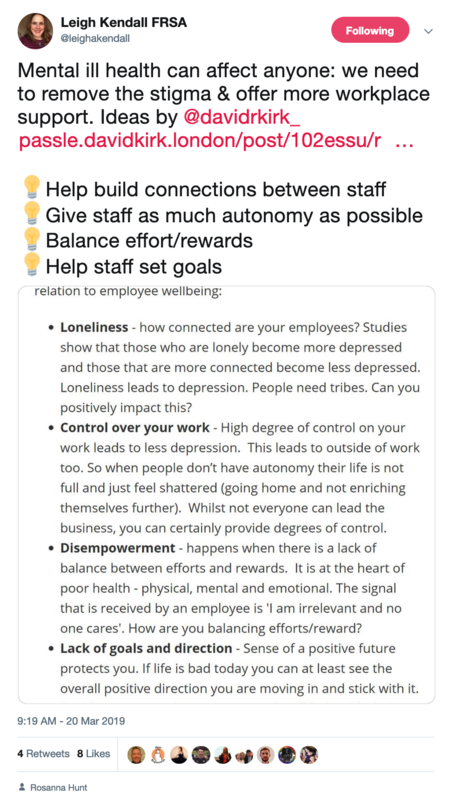 What would we need to think about, and what would be the benefits if they were? 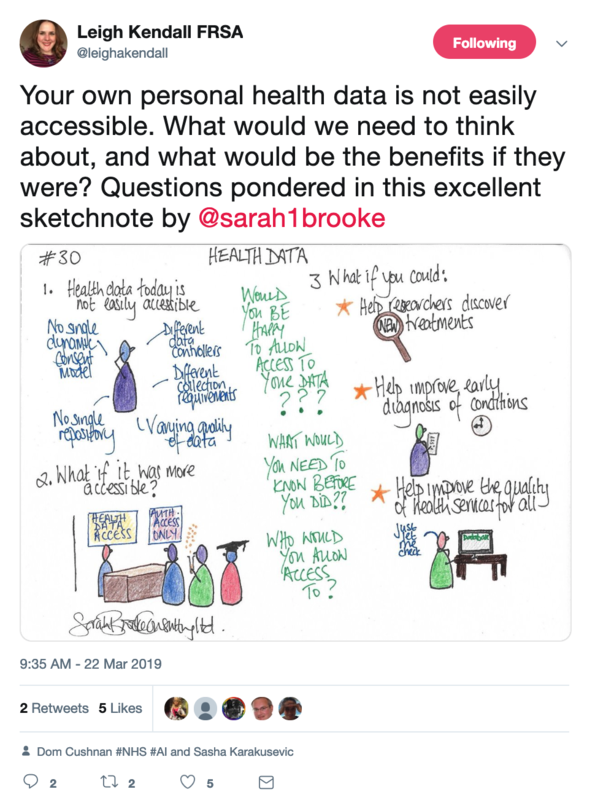 Questions pondered in this excellent sketchnote. 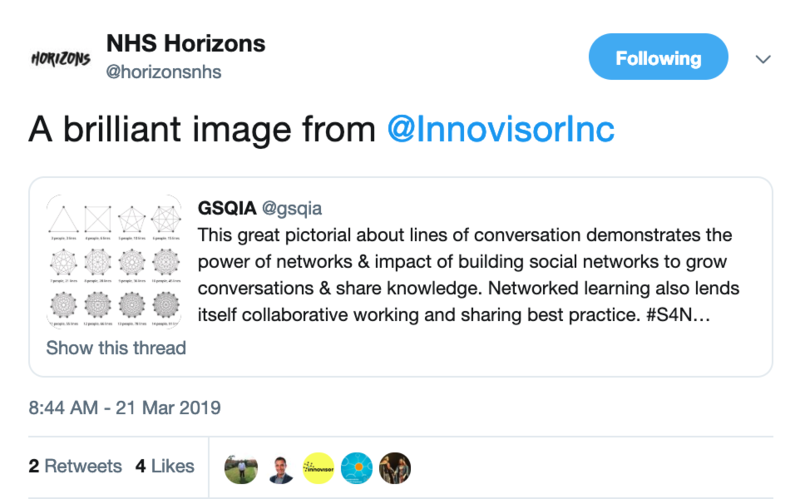 This great pictorial about lines of conversation demonstrates the power of networks and impact of building social networks to grow conversations and share knowledge. Networked learning also lends itself collaborative working and sharing best practice. 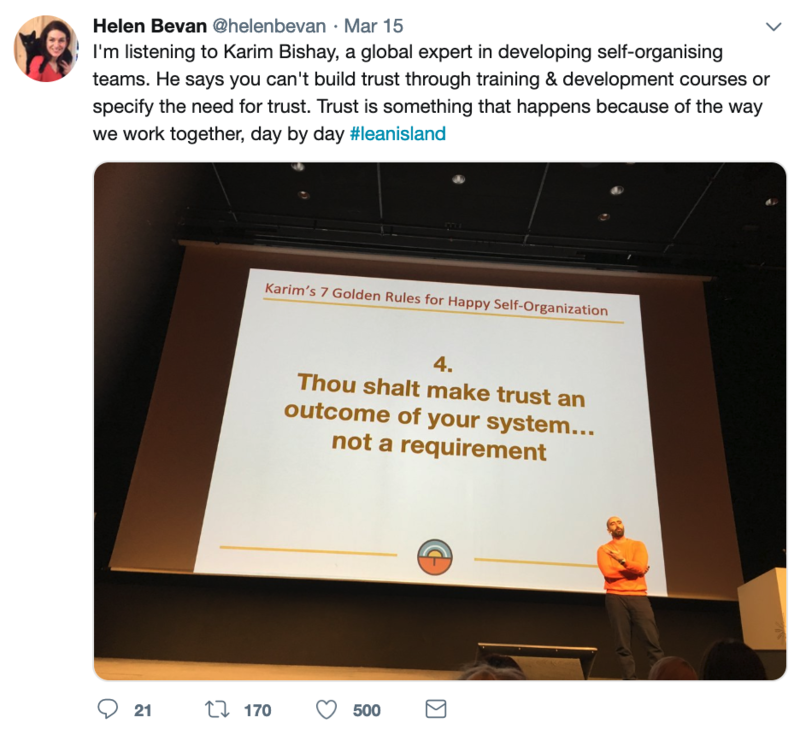 You can't build trust through training & development courses or specify the need for trust. Trust is something that happens because of the way we work together, day by day. 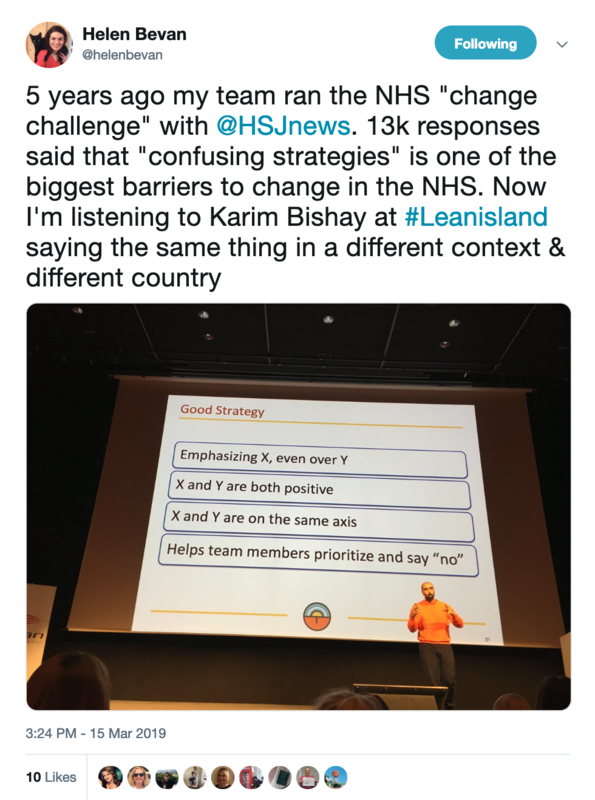 "Confusing strategies" is one of the biggest barriers to change, regardless country or context. 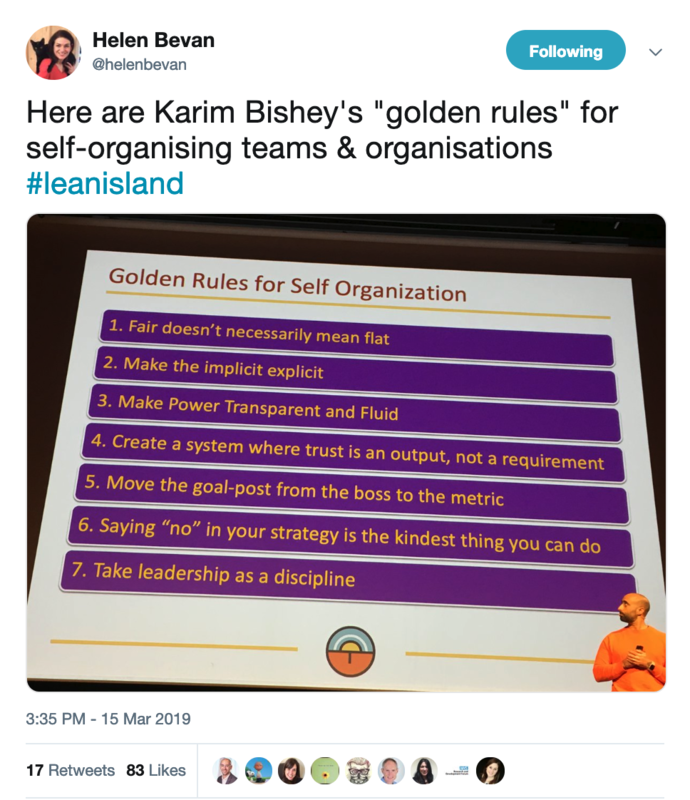 Here are Karim Bishey's "golden rules" for self-organising teams & organisations. 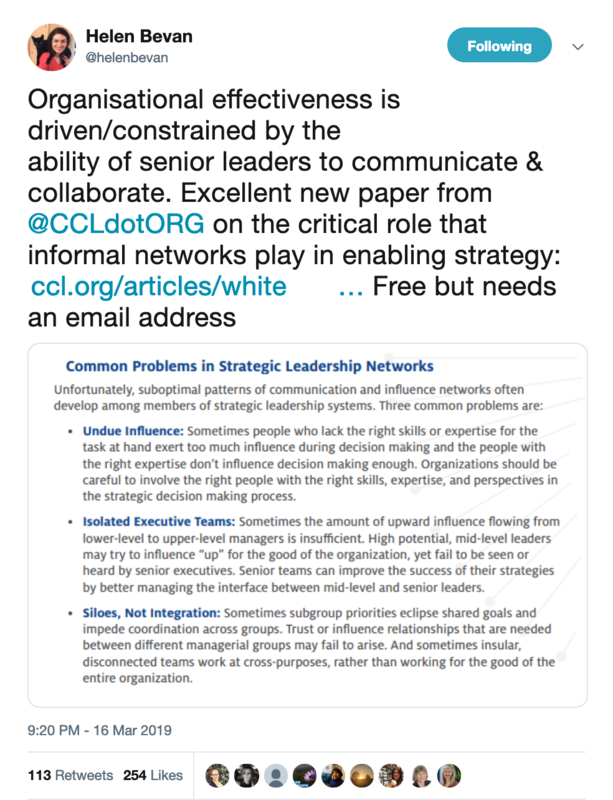 Organisational effectiveness is driven/constrained by theability of senior leaders to communicate & collaborate. Excellent new paper on the critical role that informal networks play in enabling strategy. 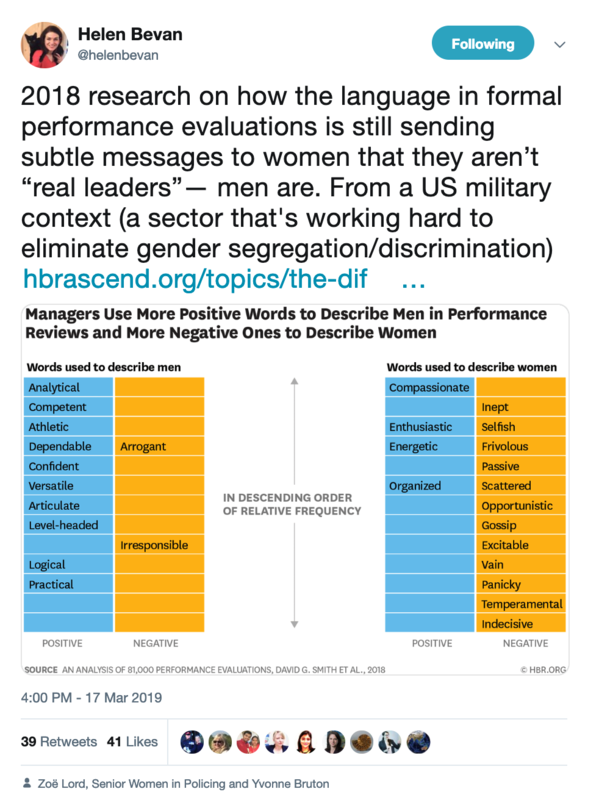 This research shows how the language in formal performance evaluations is still sending subtle messages to women that they aren’t “real leaders”— men are. From a US military context (a sector that's working hard to eliminate gender segregation/discrimination). Are Students Leaders? 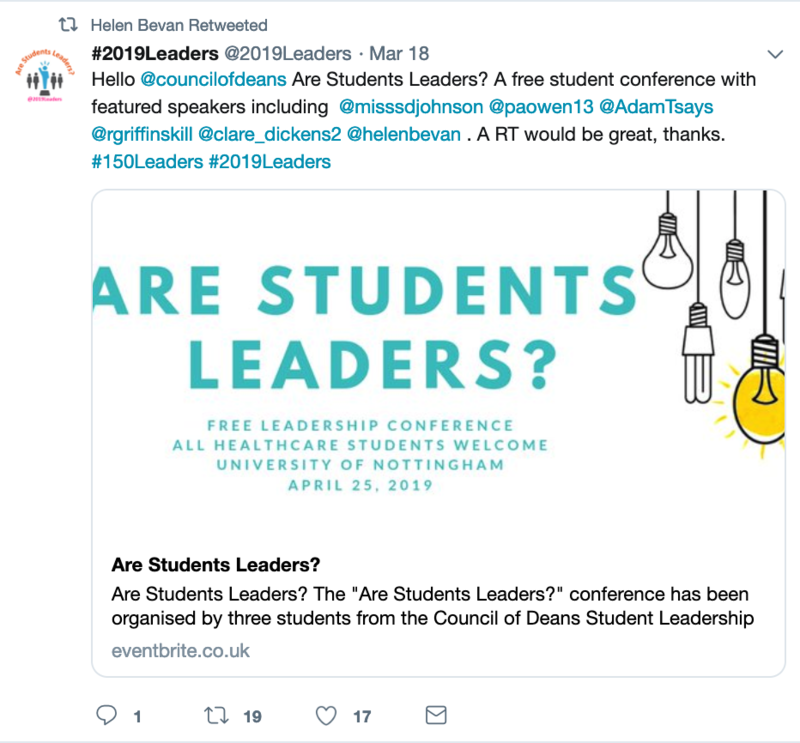 A free student conference with featuring Helen as a guest speaker.